"My quilt captures the beauty of flying; my grandfather, my husband, and I are all pilots. My grandfather has just been moved to a nursing home, so I wanted a quilt to comfort him and remind him of the beauty he saw when he was flying. 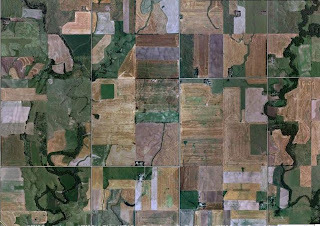 I chose a Disappearing 9-Patch design to capture the patchwork you see when looking down at farmland, forests, and peoples' yards. The quilting is simple to ensure that the overall pattern of interlocking fields of all different shapes really stands out. "For once you have tasted flight...there you will long to return." -DaVinci "
This was my inspiration photo - it was taken from Google Maps, somewhere over Kansas...go figure, right? This piece of land epitomized the "patchwork" of the land below very well. The second quilt I finished was my mom's quilt. 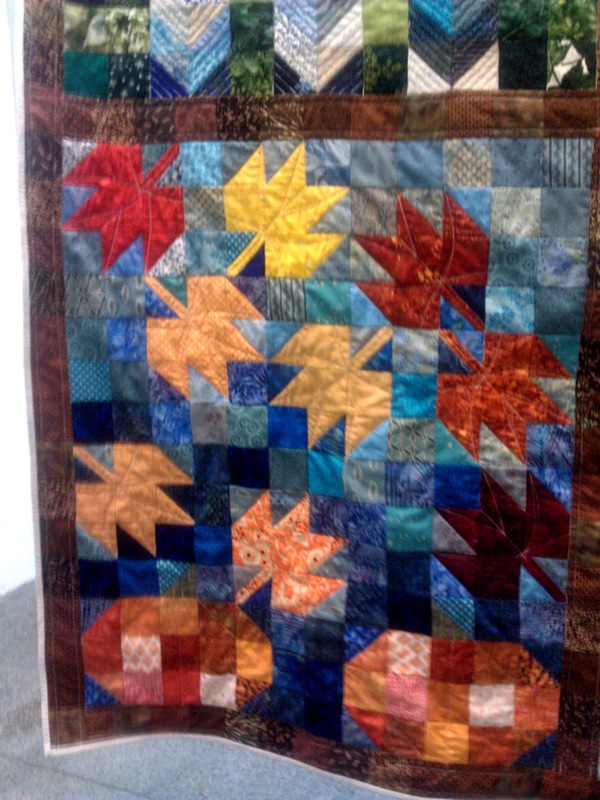 The falling leaves quilt, full of brilliant fall colors and (I think) somewhat whimsical quilting. The overall quilt - I love it. The lighter squares on the tree remind me of sunlight filtering through the leaves, and the leaves are just as random as I'd hoped for. They really look like they're all falling because of a stiff gust of wind. I really love this quilt! A closeup of a few of my favorite leaves, showing off the quilting in the leaves. Each leaf's veins is totally different, which makes them even more perfect in my mind. I learned on this quilt that it's hard to quilt backwards one-handed on a curve (my machine's reverse lever requires one hand to push it). But I managed! More than a few of the leaves are actually made out of leafy fabric, which makes me all kinds of happy and giggly inside (which my husband thinks is a little crazy, but hey - I made it, I reserve the right to be happy and giggly inside). A closeup of the tree's hole. This picture was taken while draped on the couch, so the quilting is a bit more symmetrical than that. I'm glad that I didn't use a 100% black fabric for the hole - after all, you can usually see a bit of the wood farther back in a hollow in a tree. 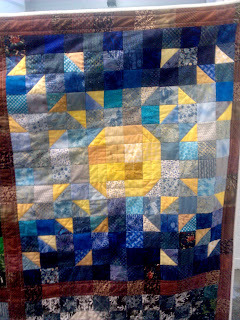 And I love that the quilting added depth. 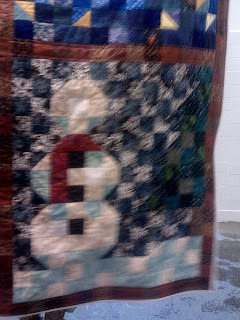 You can also see the quilting on the tree here too - freehand mostly vertical lines, spaced randomly apart. It mimics actual maple tree bark (the leaves are maple leaf blocks, so I stuck with that theme). Closeup of one of the better areas of grass. The grass was interesting to try to sew, as it was totally free-hand with nothing to follow. At least with the veins on the leaves I had a general place I knew the line had to go. 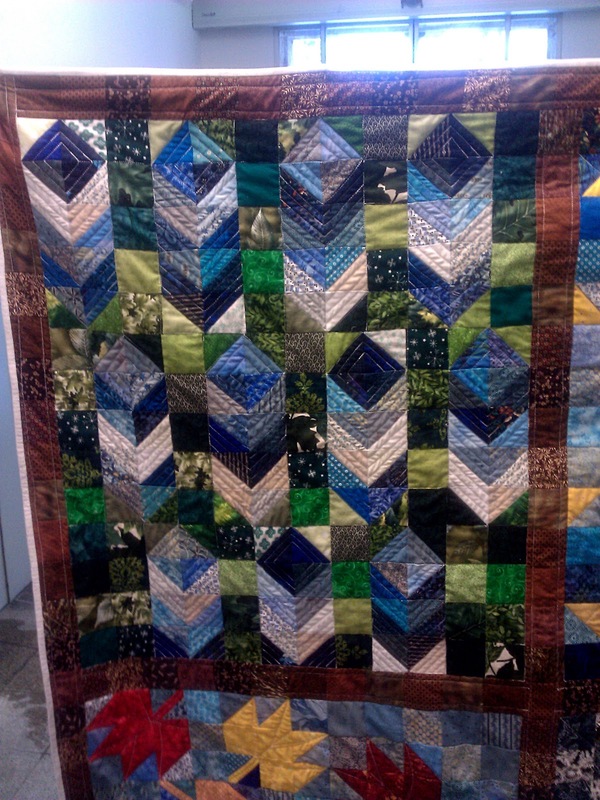 Not all of the grass looks this grassy, but this quilt was a huge learning point for me. I've never done anything like this, both piecing-wise and quilting-wise. You can see I chose a nice red for the binding (I'm almost out of this fabric, which makes me really sad...the selvage said "Kimono Collection" and it was purchased at Joann's about six years ago...it was red with gold butterflies on it) at my husband's suggestion. I usually get his opinion on bindings and he's usually spot on with his choices. Finally, Texas Mom's quilt. I apologize for these pictures as they were taken with my husband's cell phone in the hallway of the post office prior to wrapping it up and sending the box to Texas. Fluorescent lighting + cell phone camera + door behind me that people came into, bringing the wind with them = blurry pictures. Hopefully by next week I'll have better pictures for you. The package didn't get there in time for Christmas (stupid Postal System!) and they left yesterday to go to New Mexico and Colorado so it will be there when they get back and I'll bribe one of my brothers-in-law to get some better non-blurry pictures of it. Overall view of the quilt. 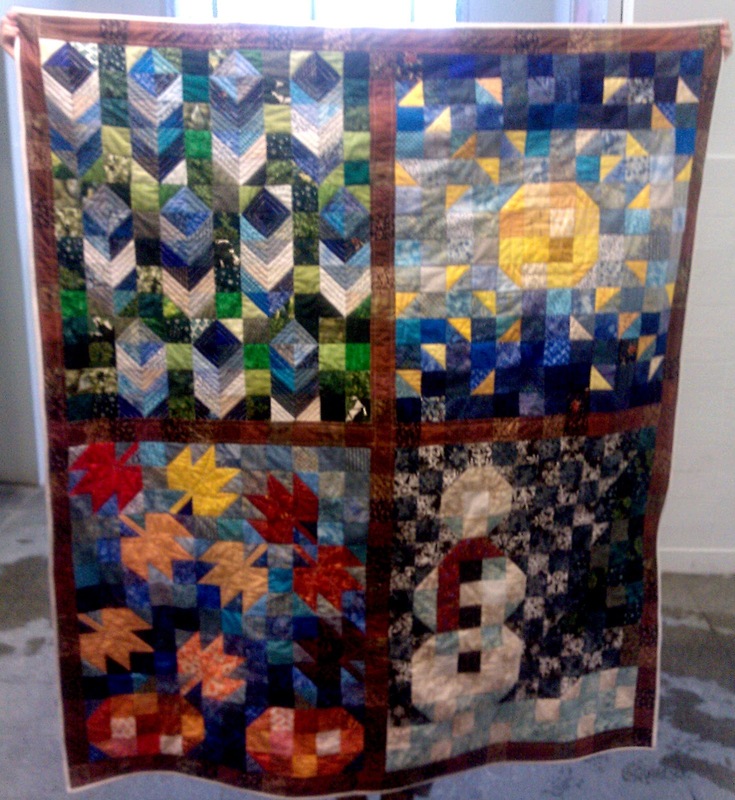 It's a 4-Seasons quilt, so I wanted it to look like you were looking through a window. I tried to strip-piece the brown window-border, but realized that my seams weren't exactly straight, so my cuts weren't exactly straight so the outside edge doesn't line up with the squares in the quilt. I learned to let go and not care with this quilt...a valuable skill when I can't seem to sew a straight seam to save my life. At my husband's suggestion, I bound this quilt with white. It gives it a bit of a bright edge, and lightens up the neverending brown. A blurry picture, but you can kind of see what's going on here. I tried to use the light blue squares to shade the snowman and snow on the ground. I quilted this section by outlining everything (top of the snow, outer edge of the tree, buttons and scarf, snowman parts). I quilted in the ditch on the background squares but also did diagonal lines both directions (/ and \) so in the corners of the background squares it made asterisks - kind of like quilted snowflakes! I echoed the tree's outline into the foliage about 1/4-1/2" apart. The blue squares in the sky have snowflakes on them too, but they're not as easy to see in this picture. The white and blue in the snow also have snowflakes. You might recognize some of these leaves - I quilted them just like on my mom's quilt. The pumpkins (which do have half-square triangle stems on top) are outlined and have pumpkin curves quilted into them. The stems have close-set lines to mimic how the stems look on real pumpkins. This is the summer pane. It's a stylized sun, and I quilted the sun itself as echoes. I put out straight lines up, down, and left to right emanating from the sun, and I also did lines on the diagonal (you can see them bisecting the diagonal triangles). I then outlined each of the little triangles. I'm slightly peeved about this pane as I placed some of the triangles wrong, but if you didn't know what it was supposed to look like, hopefully it doesn't show...right? Finally - the spring pane. The bluebonnets look slightly bluebonnet-ish, although I think they're a bit more wheat-ish. Regardless, I like them and the quilting does make them stand out from the background. I quilted them 1/4 inch apart following the V shape made by the way I pieced them. In the top diamond I echoed the diamond shape into itself. It was a lot of turning the quilt (most of these pieces were) but it worked. I quilted in the ditch for the green background squares to hold them down but nothing closer than that - I have found that if you want one part to stand out, quilt that area heavily and everything else loosely and it will truly stand out. So there we go - my sprint-a-thon is finished and I'm free to not quilt if I don't feel like it. I'm trying to finish a few WIPs so hopefully I'll have some good news to report on that front! I have a baby quilt that's about 3 months overdue already, and it's hand-quilted (it was my work on the plane ride over here, and you really just can't mix hand-and machine-quilting on the same quilt, so lots more hand work to go!) so it'll take me a bit longer. I'm almost 3/4 done with the quilting, so hopefully by February at the latest...let's hope! My husband is holding me to the "finish Heather's baby quilt before starting anything new" thing so I guess I'd better get to work. I hope you all had a wonderful Christmas, and here's to having a great new year! Wow! You really got a lot done and each quilt is so special. I hope you have time to take a deep breath before you start the next marathon. adorable!! I love how each quilt is so special to its intended!! They are beautiful!! And remember, only 363 days left to sew for Christmas! The quilts look amazing - I love them and it great to hear/read the stories of the inspiration and designing the quilts. I am so inspired by what you have accomplished! Way to go! I guess I don't have any excuses now for not finishing my UFOs. My goodness. Your quilts are very nice. I am sure that they will each be cherished. You sure put a lot of work into those. Love how you described them all and the quilting on the leaf quilt. The flying quilt is a good replica of the KS fields. I love the KS fields in the summer, tall green corn and lots of it. In the fall/winter lots of geese land in them making them look like salt and pepper. WOW! Gorgeous quilts you have made for your loved ones! I'm sure they all love your generous and personal gifts. I see what you mean about the leaves.